Have a small boxed website with all your blog posts by setting your site width to 720px and removing the sidebar. Also set accent, background color and font to any you wish. Share your social links in a colorful bar to the left. Enable a light and dark color switch for the entire layout. Make it easier on the eyes for the reader. 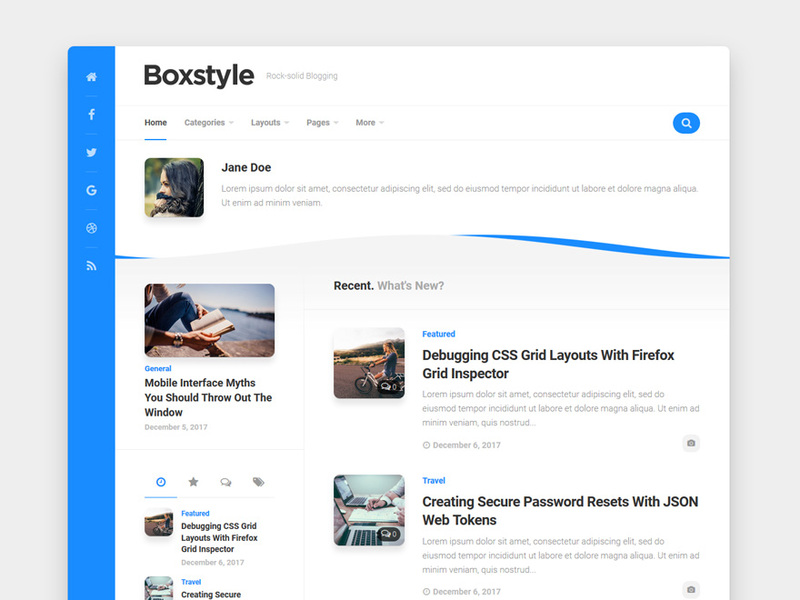 How to add a slider on the main page of the site as in demo?Between the word Boxstyle and publications? It does not work! Please use the support forums for support questions. Hello. Your template is incredible! Thanks for doing such a thing. I understand that you do not give an import file to free themes? Then maybe you can tell me how to set it up so that it looks like in a demo? The article can not customize the display of pictures (I have only the title). Please, who knows – tell me. How to set up the main page? In the previous template, I put a static page, now (if you select a static page) articles are not displayed. How to set up a sidebar on the main page? I tried everything, but I can not understand.